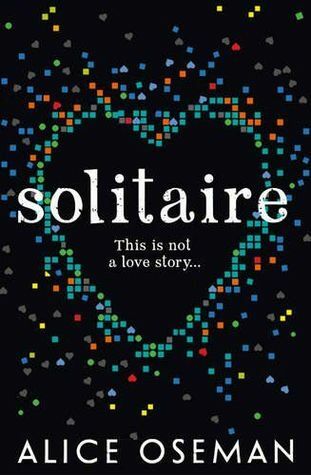 Alice Oseman wrote and published Solitaire while still a teenager. That’s just one of those things that’s crazy impressive and also makes me a little sad. Tori Spring is a pretty typical teenager in book land anyway. In other words she’s a bit rude and a bit of a snot that is convinced the world is too ugly to live and everyone (but her) is a fake. Her school comes under attack from some blog/hacker site called Solitaire which starts out doing silly but wildly impressive stuff and then escalates into bigger and more dangerous things which Tori believes she can stop because the blog is targeted to appeal to her. Okay, overall I was torn on this debut. Love her or hate her (and I kind of hated her) Tori’s a strong voice who kept me interested in the beginner which was good because the Solitaire stuff doesn’t really get going until almost the end. Solitaire’s big final act is also when everything started to fall apart and get muddled for me. I do wish that element had been stronger as well as the blogging element. It’s mentioned a lot that Tori’s a blogger that the only place she feels she can be real is on her blog but nothing is really done in the story with it. There are elements of Tori’s final showdown with Solitaire and the lead up to it that come off in my opinion more like a breakdown than anything else and a serious one. There are some issues with Tori’s brother that are mentioned throughout so I’m thinking to myself the seed is there. And the finale itself just seemed so over the top to me that it came off as not quite real or right. I had so convinced myself by that point of Tori’s mental issues that it probably deserves a reread. There is talk of going to get help but it’s all very surface both for her and her brother. Like a lot of things in Tori’s mind I think that element was trying to be deep but really wasn’t for me. Also the boys: okay Lucas shows up and his deal is pretty obvious right away. But Michael? Tori’s never meet him before but he targets her for some reason. The relationship is pretty typical high school movie stuff but the strange thing again was nearer to the end I was wondering if she wasn’t imagining some stuff. For instance she kept saying that he seemed imperious to the cold (a snowstorm at one point) or that she wouldn’t see or talk to him for days and then he’d just appear or she’d call him and he’d appear from nowhere a minute after they hung up. Michael is real- he interacts with other characters in the story but at certain points in the novel I was really wondering and honestly I think I found him fairly creepy. Recommend: If you’re into interesting new authors and teenagers who believe they are the only “real” people in the world I would give this a go otherwise I’d give it a pass.